When something sells out at Sephora (especially when it sells out more than once), we take note. The beauty retailer carries some of the best products on the market, so when it can't keep something in stock, that something has to be good. That's the case with a buzzy new product from an L.A.-based skincare brand, called Peace Out Skincare. The product isn't a cleanser, moisturizer, or toner; it's a little more original than that. It's a collection of acne-healing dots. These small round "stickers" adhere to a blemish on your face, delivering potent, acne-fighting, and skin-soothing ingredients over a period of time in order to quickly cure the flare-up. 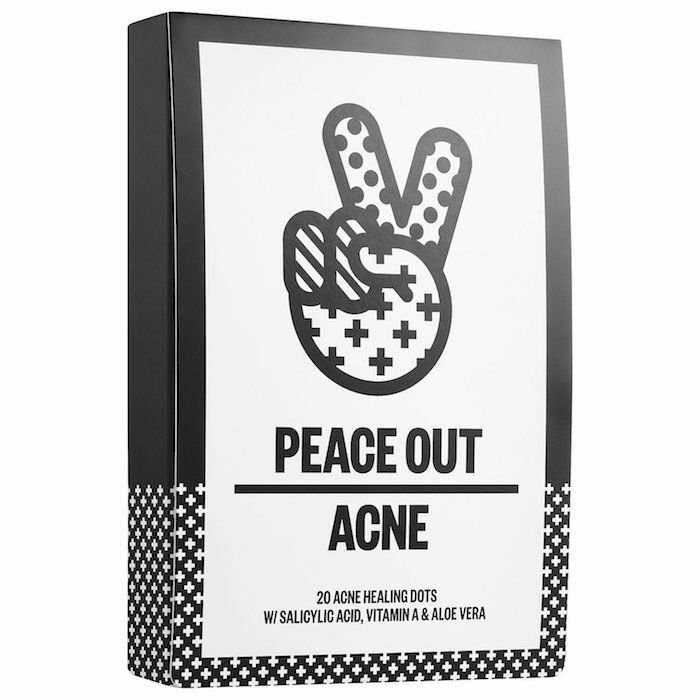 The product claims that you'll be able to say "peace out" to your acne within six hours of use, which is an impressively short period of time to wait for clear skin. The secret is in the protective layer of each "dot." The hydrocolloid dressing extracts debris while forming a protective layer to defend against irritants. Salicylic acid kills any bad bacteria present, and vitamin A and aloe vera regenerate skin and soothe redness. Simply apply one of the stickers to the acne flare-up you wish to banish from your complexion, go to sleep, wake up, and peel off. The blemish should be significantly improved. Cool, right? Think of these mini dots like little acne-fighting soldiers. Because they're in prolonged contact with the blemish, the healing ingredients continuously work their magic, unlike other spot creams, which can fade or smudge over time. Other brands have hopped on the acne-dot wagon, too. Take Peter Thomas Roth, for example, which sells a similar product called Acne-Clear Invisible Dots ($12). Even though the Peace Out dots were sold out, it looks like Sephora has restocked. Just don't wait until they're sold out again to try them out for yourself (as the old saying goes, history tends to repeat itself). Next up, see the two products Selena Gomez's hairstylist used to give her an ultra-cool wet-look hairstyle.